"Cosmos: A Spacetime Odyssey" recounts the creation of the first world ocean seafloor maps by American geologist Marie Tharp (voiced by Amanda Seyfried) during "The Lost Worlds of Planet Earth" on Sunday, May 4, 2014 on Fox. Sunday's episode of "Cosmos: A Spacetime Odyssey" takes a look at the "autobiography" of Earth written in the planet's atoms, oceans and continents, according a Fox description of the episode. 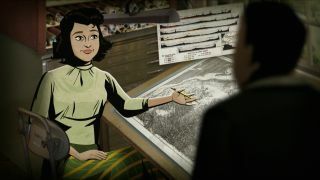 Seyfried ("Mamma Mia") will lend her voice to noted American geologist Marie Tharp during one of the episode's animated segments used to reenact great discoveries in science. "Cosmos" will recount Tharp's creation of "the first true map of Earth's ocean floor, and discovers microscopic life that exists deep beneath the ocean," Fox officials wrote in a description of the episode, which is entitled "The Lost Worlds of Planet Earth." Tharp and her colleague Bruce Heezen, a marine geologist, completed their first maps of the Earth's oceans between the 1950s and 1960s, according to a Library of Congress account. Tharp died in 2006. The 13-episode "Cosmos: A Spacetime Odyssey" is a 21st-century reboot of the classic "Cosmos: A Personal Voyage" hosted by famed astronomer Carl Sagan in 1980. The new series debuted on March 9 and is hosted by astrophysicist Neil deGrasse Tyson and written by Ann Druyan and Steven Soter. "Cosmos: A Spacetime Odyssey" airs Sundays at 9 p.m. ET/PT on Fox. It is rebroadcast on the National Geographic Channel on Mondays at 10 p.m. ET/PT. Check local listings.